A while ago I made an asparagus and gruyere tart that I really enjoyed. It was pretty much as easy to make as rolling out the puff pastry, throwing the toppings on and baking it. The tart was so good that it is still on my mind and I have been wanting to try new variations of it. I had been thinking about doing a zucchini version and since I had some extra zucchini on hand it was the perfect time it try it. I have also been enjoying the zucchini, feta, lemon and herb combo lately I wanted to try to work them into the tart somehow but I would need something to bind everything and hold it together. When I was looking for recipes for Greek phyllo pies I noticed that some of them used ricotta cheese and I thought that the ricotta along with an egg would help hold all of the toppings together. This zucchini tart was also pretty easy to pull together and it turned out great! 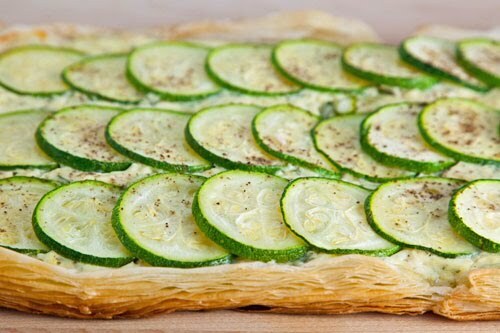 The zucchini, feta, herb and lemon combo was amazing and it worked really well on the light, flaky and buttery puff pastry. All of the flavours from the kolokithopita (Greek zucchini pie) are in this tart but the puff pastry is much easier to work with than the phyllo dough so this is a great quicker and easier alternative. Mix the ricotta, feta, lemon, herbs, egg, salt and pepper in a bowl. Roll the puff pastry out to a 16×10 inch rectangle. Score a line around the puff pastry 1 inch from the edge. Spread the ricotta mixture over the center of the dough. Arrange the zucchini slices in a single layer on top of the ricotta mixture. Brush the outside inch of the pastry with the oil. Bake in a preheated 400F/200C oven until the zucchini is tender and the pastry is golden brown, about 15-25 minutes. wow, does that ever look beautiful! Oh Kevin – why does puff pastry have to be so buttery and delicious? Why can't it be healthy like zucchinni? Thanks for sharing! Another great way to use zucchini! I do love making tarts with puff pastry – I have you to thank for that! that crust looks so good! Awesome way to use up zucchini and squash in a beautiful manner! I really need to get over my fear of using puff pastry. There are way too much fantastic recipes, like this one, I want to make. Yum. This looks so fantastic–makes me hungry even though I just ate! I'm trying this one!! Not sure why I've never combined ricotta and feta, but really, how brilliant is that?! Sounds so good. This looks gorgeous, Kevin! Well done! Sorry, I've been so scarce lately. A lot going on on the home front has really limited my surfing time. This looks so yummy, Kevin! Nice job! That looks like it would be great for a finger food party, very crisp and light.. So many great zucchini recipes have come out this past summer included this tart. Yum!! A great combination with the cheese. Looks amazing, I would definitely try this, phyllo pastry can be tricky to work with! What a refined looking tart! Nice combo! What a delicious combo of flavors – some of my favorites. This is alos such a pretty tart! healthy topping and buttery crust..yum! That looks so simple and good. You have definitely got me craving this. I love ricotta and I know that coupled with the feta and zucchini, it would be heavenly! Light, airy, angelic, a chilled glass of white wine and all will be well. Amazing…looks so flaky and light! I love tarts like this – great flavors! Very pretty looking tart and sounds really mouth watering! I just had to come out of lurkdom to comment on how delicious this sounds and looks. Yum is all I have to say!…. Kevin, this looks wonderful and a nice change from an asparagus tart. As always, your food is stunning. The asparagus & gruyere was a winner a couple of months ago! When I still had some puff pastry left from kaing it I made a courgette and gruyere tart for lunch the next day. The ricotta sounds a good idea though. I can just imagine the crispy crackly sound as you bite into it! This looks absolutely fantastic! Pure beauty! Oh my gosh – this was so good! I love your recipes!